The NanoParticle Nebulizer produces droplets with a peak diameter <1 μm in diameter. 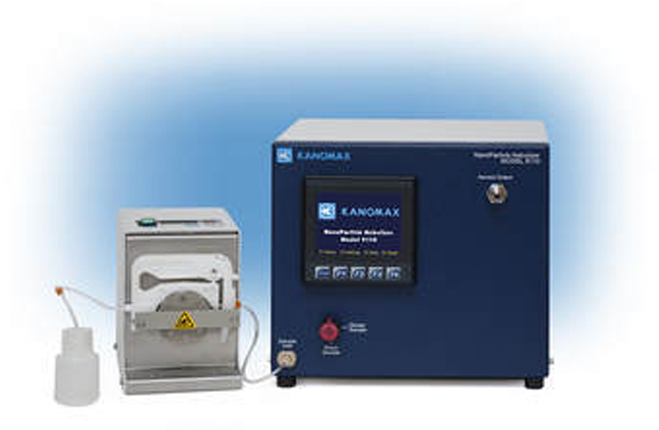 Using a traditional nebulizer to create an aerosol of colloidal particles often results in interference from any non-volatile residue present in the sample. After droplet evaporation, non-volatile residue creates particles of residue regardless of whether the droplets contain colloidal particles or not. When there is a particle in a droplet, non-volatile residue forms a coating on the particle. This coating is problematic when aerosols containing small particles (<30nm) are created such as in toxicology studies where the surface properties of any dried particle are important. The NanoParticle Nebulizer mitigates this non-volatile coating by minimizing the size of the nebulized droplet. The NanoParticle Nebulizer produces droplets almost as small as electrospray, but without the need to have a conducting liquid and the constant clogging associated with electrospray. Limits the influence of non-volatile residue on nebulized particles. Small droplet sizes reduce the potential for particle agglomerates after drying. Continuous on-line flow rate to the nebulizer. Ability to inject a small sample directly into the nebulizer. Does not require a conductive solution (unlike electrospray nebulization). Continuous monitoring nebulizer sample flow rate. Temperature and pressure logging of on-line sample flow rate. Feedback control of evaporator and nebulizer housing temperatures.